We introduced Azure Availability Zones during Microsoft Ignite as part of our continuing expansion of Azure’s support for the most demanding, mission-critical workloads. Today I’m excited to announce the general availability of Availability Zones beginning with select regions in the United States and Europe. With Availability Zones, in addition to the broadest global coverage, Azure now offers the most comprehensive resiliency strategy in the industry from mitigating rack level failures with availability sets to protecting against large scale events with failover to separate regions. Within a region, Availability Zones increase fault tolerance with physically separated locations, each with independent power, network, and cooling. For many companies, especially those in regulated industries, who are increasingly moving their mission-critical applications to the cloud, resiliency and business continuity have become a crucial focus. From online commerce systems in retail to customer-facing applications in financial services, the stakes are high for organizations and enterprises to deliver for their customers. Even a minor issue can have a major impact on a company’s brand reputation, customer satisfaction, and bottom line. In this environment, it’s imperative to develop applications with the highest operations standards anchored by a multi-layered resiliency approach. Availability Zones are now available providing an industry-leading 99.99% SLA when virtual machines are running in two or more Availability Zones in the same region. Moving forward, we’re committed to bringing Availability Zones to additional geographies to allow customers to create a comprehensive business continuity strategy with data residency. Learn more and start using Azure Availability Zones today. 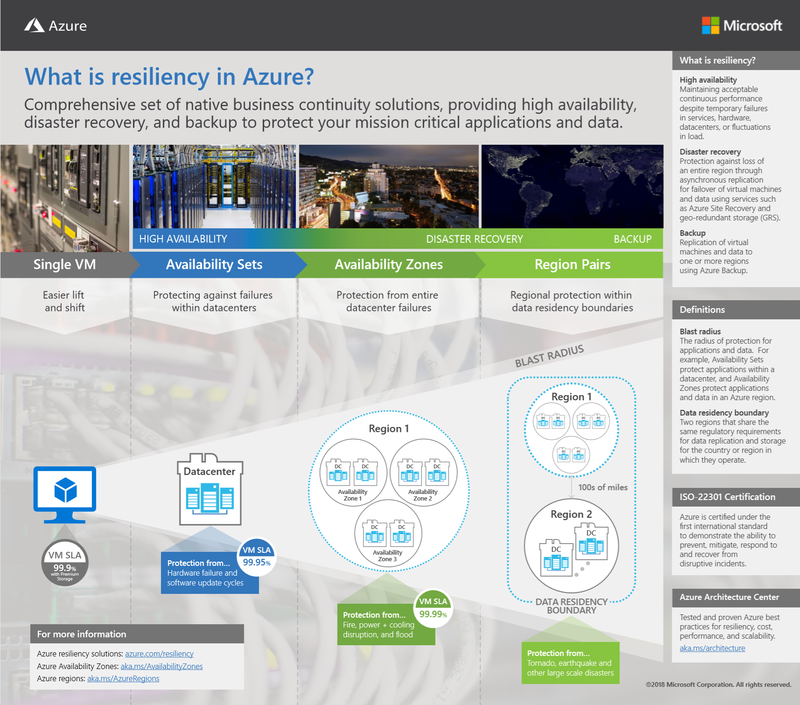 To learn more about Azure resiliency overall, visit the resiliency page.